Need a home security system on the cheap? Then check this app out from Orbiture Witness. It'll turn any Mac computer into your own home alarm system and will notify you on your mobile device when the alarm is tripped. The app will use Mac's iSight camera as a motion sensor, and Witness will instantly snap a photo when motion is detected and send the picture and video to your iPhone or iPad. 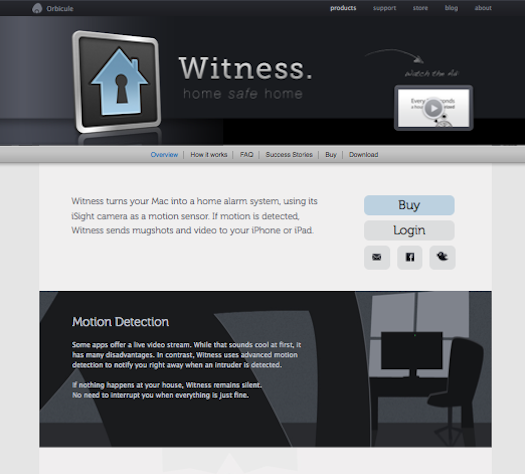 Witness is easy to use and works like an advanced home security system. It uses the location of your iOS device to automatically activate the alarm when you leave the house and switches it off when you return home. The app has a face detection sensor so the system won't confuse intruders with pets. For a single user license, Witness can be purchased for $39.